2 Course Dinner Set Menu from 16.50 at Bill's Sunday-Thursday from 5pm! 3 Course Dinner Set Menu from 19.50 at Bill's This offer is valid from 5 pm Sunday-Thursday only! Born in East Sussex, Bill’s almost literally grew from the ground up. What started as a small greengrocer, soon evolved to include a small but buzzing café, plentiful of delicious eats that was just the start of something amazing. With seasonal and sensational food always in mind - Bill’s is a place for everyone, for breakfast, brunch, lunch, dinner and everything in between! Built on strong values and with the support of lovely people too - Bill’s always has you in mind and never fails to impress and delight its loyal clientele. Discover a fresh menu, of British classics with contemporary twists. Here you’ll find flavour and decadence in an ever-changing and exciting menu. Perfect for a lunch date, coffee catch up with friends, lazy brunch or other occasion - treat yourself, take out a pal or family member and you’ll be guaranteed a swell time at Bill’s. Here you can relax in a cosy atmosphere while you revel in great grub, surrounded by the kitsch decor. There is even a Bill’s shop for you to buy delicious treats like biscuits and coffee, plus teaware, cookbooks and more - with gift cards available too - everyone can have fun at Bill’s. Get online to book and take a minute to discover the blog where you’ll find refreshing recipes, cultural news and seasonal musings to entertain you all year round too. For food, fun, drinks and the generally good things in life, head to Bill’s! How do I use my Bill's voucher? Continue to confirm your booking and be sure to let your waiter know on arrival of the offer you wish to use. Sign up to receive Bill’s news to your email to get special offers and more sent straight to your inbox. Can I amend my booking with Bill's? Yes, you will need your booking reference number and the email address used to amend or cancel your booking online. Thankfully yes, find the restaurant closest to you and select the collect or deliver options if available to enjoy your Bill’s meal in the comfort of your own home! Are there gluten-free options available at Bill’s? Bill’s has separate gluten-free menus, and many meals are suitable for vegans and vegetarians. Consult the allergen menu beforehand to find a meal that’s right for you, and be sure to let your waiter know on arrival of your dietary requirements. You will be emailed a confirmation of your booking along with a reference number. Consult your individual Bill’s restaurant page to see when they are open. Email Bill’s online for general queries or contact your restaurant specifically. Bills is a chain of restaurants that can suit any taste buds, any time of the day. 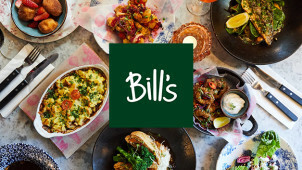 From breakfast through to evening meals, Bills provides dishes ranging from the traditional classics to takes on modern cuisine. So whatever time of day, pop in and use your Bills voucher for a great meal, for less of the price. The restaurant prides itself on using quality, seasonal ingredients so you know you’ll get the best every season. For a meal with a buzz, get down to Bills today! Bills originally started out as a Greengrocery shop. However, after a flood in 2000 the shop had to shut doors. The founder - Bill Collison - decided to re-open and add a café this time round. The café flourished and became a bit of a sensation, developing into Bills Restaurant as we know it today. Therefore, as the founder started out as a greengrocer, you can rest-assured fresh and seasonal ingredients are of great importance to the business. At Bills, there is the option to ‘go naked’ with their hamburgers. This means ditching the bun and fries and enjoying the burger bunless with salad and tzatziki instead. Perfect, if you’re trying to lessen the calories or avoid gluten. On the contrary, if you want to load up on the burger front, there are a variety of extras you can add including bacon, guacamole and falafel. Save on your food with a Bill's discount code, whether you're going naked or fully-dressed up - the choice is yours!